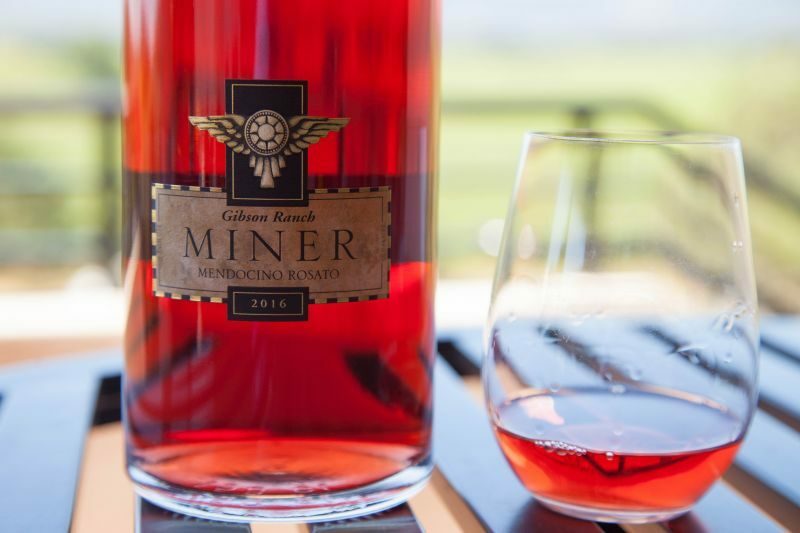 California Girl and I were invited back to Miner Family Winery to meet the winemaker and learn more about their wines and philosophy. 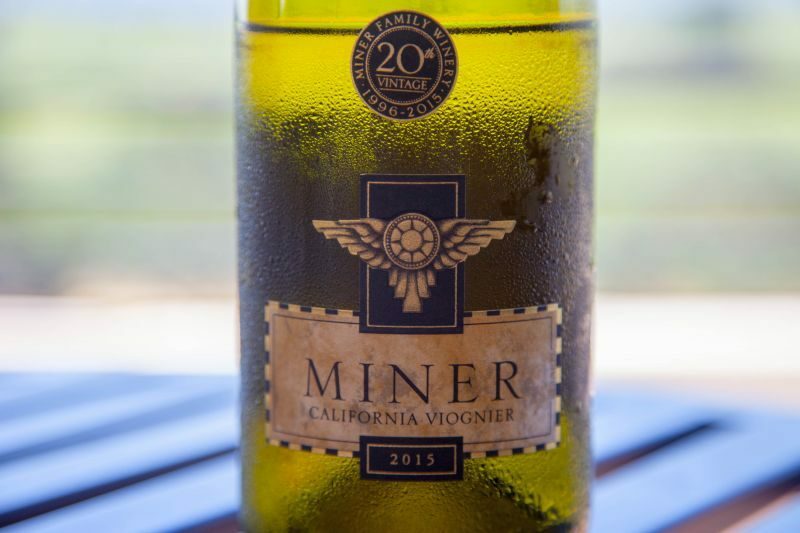 Stacy Vogel, a Davis alumni, has worked at Miner Family Winery since 2008 and been head winemaker since 2013. Stacy had served internships in Australia and Burgundy. California Girl comments: We really enjoyed Stacy. She’s down to earth and fun and she has a very nice way about her. She set the tone for the visit, casual, and comfortable – leaving us with a feeling we really enjoyed. 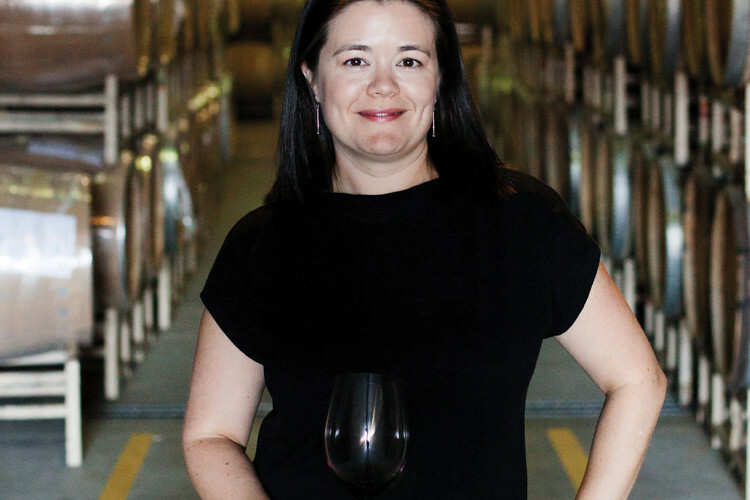 All of those qualities shine in the wines she makes. We also had the opportunity to meet the owner Dave Miner and sit and chat with him over a glass of wine (or two). He also has that open, friendly personality that made us feel welcome. Stacy gave us a tour of the facility, starting off by pointing out the guitars in display cabinets. Dave Miner, the founder and president, is a musician who loves to collect guitars. 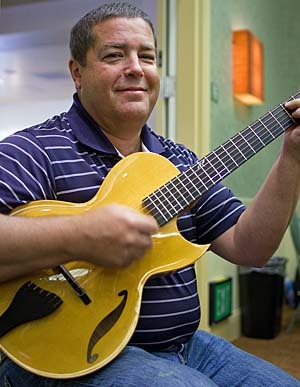 He is Chairman of Benedetto Guitars, a Georgia manufacturer of jazz guitars. 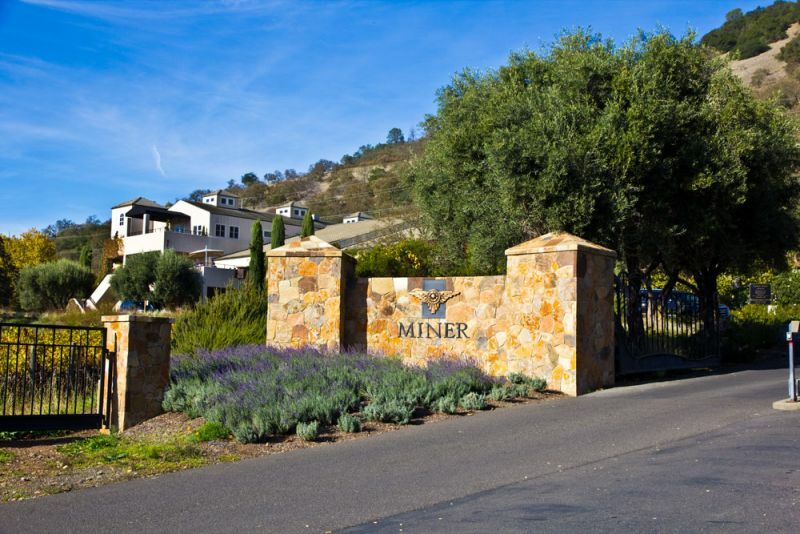 Miner Family also sponsor a stage at Bottle Rock, a wine, food, and music festival that happens over Memorial Day weekend. 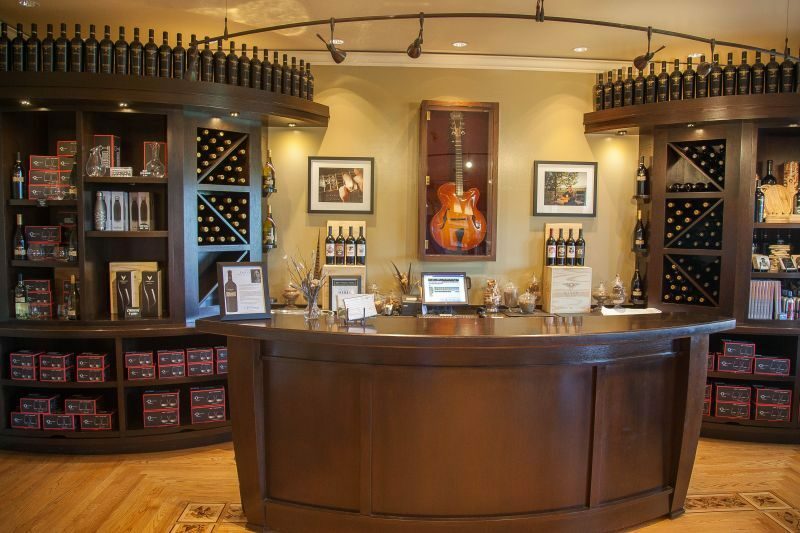 California Girl comments: Dave apparently is known to pick up one of the guitars out of the case and just start playing right there in the winery. How cool is that? 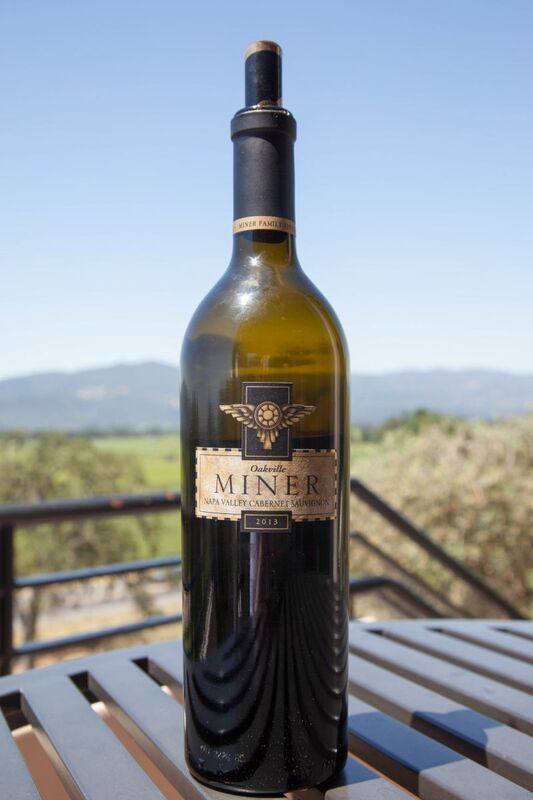 Due to Dave’s love of music, Miner Family Wines are big sponsors of BottleRock in Napa every year. So much so, that the main stage is called the Miner Family Stage. I have yet to attend BottleRock, but after talking with Dave and Stacy, I am excited to attend next year. Dave Miner is also a great of hockey. 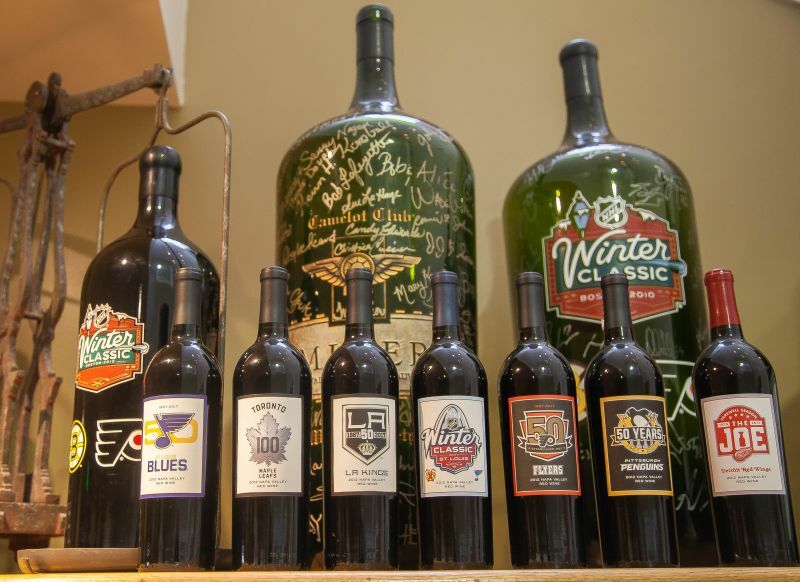 Miner Family provides the official wine of the NHL (National Hockey League). When we met Dave Miner he was wearing a San Jose Sharks polo shirt. Stacy took us outside to show us a machine for crushing grapes that had been built to her specific requirements. It was designed to be as gentle as possible to the fruit, keeping the grapes intact for as long as possible. One of many steps that show Stacy’s care and attention to every step of wine production. Miner Family grow almost no grapes. There are three-quarters of an acre of vines at the front of the winery. The rest of their fruit is sourced from growers across Napa Valley and beyond. They work with ten to twelve different farmers. Stacy emphasised the importance of good communications with these producers throughout the growing season, to understand how the vines are growing. Selecting the right growers ensures there is no need to tell them what to do, as they are already doing it. We were then taken into the caves, which were drilled in 2000 and took fifteen months to complete. There are twenty-two thousand square feet of caves, providing space for three and a half thousand barrels. 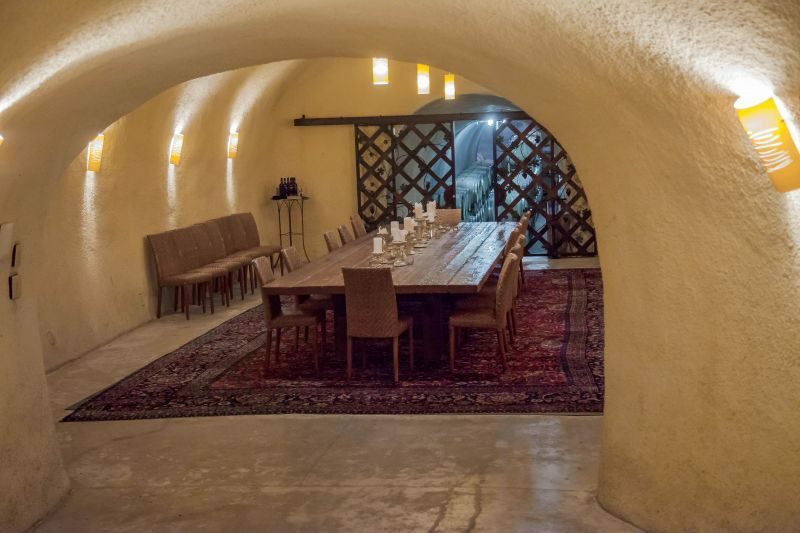 There is an event space in the caves, with a massive table made of solid planks of oak. It was built in place and when the carpet on which it sits needs to be cleaned, a forklift is required to lift the table. One of the advantages offered by sourcing grapes is the ability to make a wide range of wines. Stacy said that she makes wine from about twenty different varieties of grapes. We were taken to the terrace and offered an opportunity to experience some of the varietals. I had noted in my previous visit that Miner Family use stemless glasses. I took this opportunity to ask about the choice. There are several reasons. Stemless glasses break less frequently, especially as they are less prone to being blown off tables by errant gusts of wind. Stemless glasses stack more efficiently in a dishwasher; especially important as Miner use a separate glass for each of the six wines that make up the tasting experience. On Saturday they have two people whose job is to clean glasses. The oft-stated disadvantage that grasping these glasses warms the wine is not an issue when you are tasting and the glass has only a small pour. We started with the 2015 Viogner ($22). The grapes are from Paso Robles and the wine is fermented in all stainless steel. The nose was of pineapple and grass. Taking a sip I found a crisp off-dry wine with robust fruit flavour with melon in the lead role. I would have described this as an ideal summer-sip, but we tried an even better entry in this category later in the tasting. The Wild Yeast Chardonnay ($50), that I had on my previous visit, was more interesting than I remembered. Possibly, its complexity had been overshadowed by the strong floral characteristics of the wine that had preceded this Chardonnay. On this occasion I found the nose of vanilla and honeysuckle to be rich and enticing. The taste was complex, with hints of apple, pepper, butter, and granite. Returning to the wine at the end of the tasting, when it had warmed, the flavour had further improved with the taste of apple more clearly defined. Unfortunately, this was the last day that the 2013 was being poured in the tasting room. The aforementioned best choice for summer sipping was the 2016 Rosato, a rosé wine made from Sangoivese. The nose was lush strawberry and melon. The mouthfeel was soft, with a dry finish that avoided strong acidity and was fruit-forward. The wine is $26 a bottle, or $52 for the magnums, in the distinctly shaped bottle. These larger format bottles are usually sold by the end of the month of release. California Girl comments: The Rosato was one of my favorite sips of the day, and I have to say that I was a little disappointed that we didn’t have room in our cellar for an entire case of the stuff. 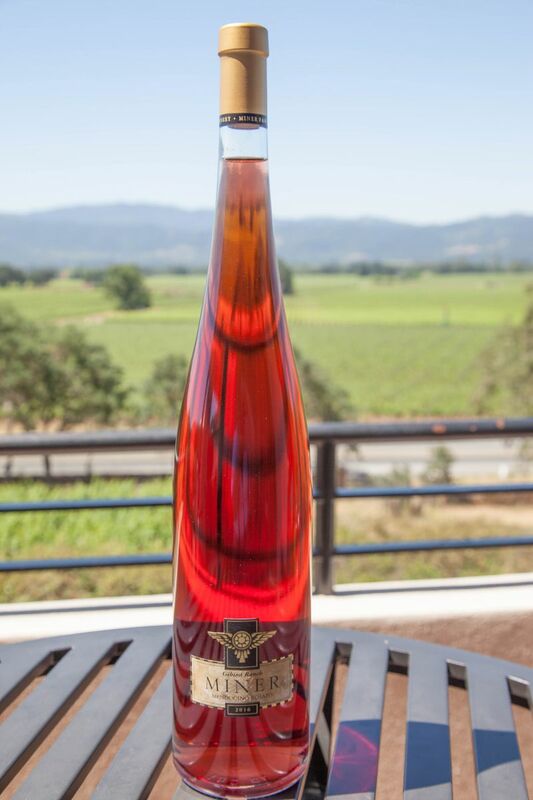 It sells out quickly, and as much rosé as we are drinking already this summer, we just didn’t have room for any more! Next year though, we will be stocking up on this beauty. We tasted the 2014 Emily Cabernet Sauvignon ($50). Made from a mix of valley floor fruit and grapes from the Stagecoach Vineyard, which sits eighteen hundred feet above that floor. I was impressed with the 2013 Emily that I had tried on my last visit, but this was better. It manages to strike that difficult balance for a Napa Cab of being drinkable now, but with a complexity that suggests it will age well. The blend is 76% Cabernet Sauvignon, 19% Cab Franc, and 5% Merlot, aged for twenty-one months in oak. California Girl comments: This was a toss up for my favorite sip of the day. Complex yet smooth, ready to drink without that huge overwhelming flavor one normally associates with a Napa Cab. This is far more subtle and elegant. A note here: 10% of all sales of the Emily go to the V Foundation for cancer research. The 2013 Oakville Cabernet ($75) was a sharp contrast. This was a wine that needs time before you drink it. The nose was of green pepper and plum. The tannins were front and centre, but the plum fruit held promise of far better things to come. 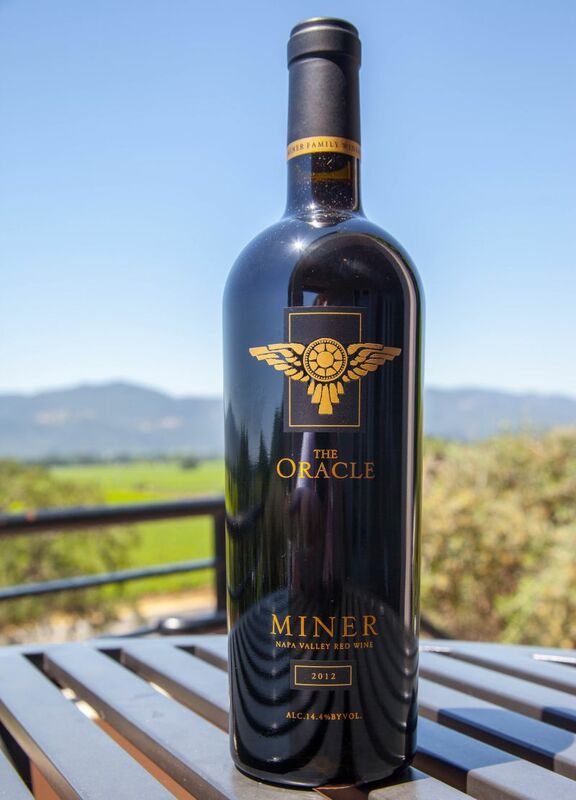 The Miner Family flagship wine is called Oracle ($90). Dave Miner said that it is a wine that asks questions of the wine, but “Hopefully never turns out as a Greek Tragedy”. Five people work on the blend. We sampled the 2012, a mix of Cabernet Sauvignon, Cabernet Franc, Petit Vedot, and Malbec. The aroma was rich and complex, with plum, blackberry, and dark chocolate. Taking a sip I was imoressed by the lush flavours of recurreant, plum, raspberry, and silt. It is an excellent wine; enjoyable now, but almost certainly not yet at its best. 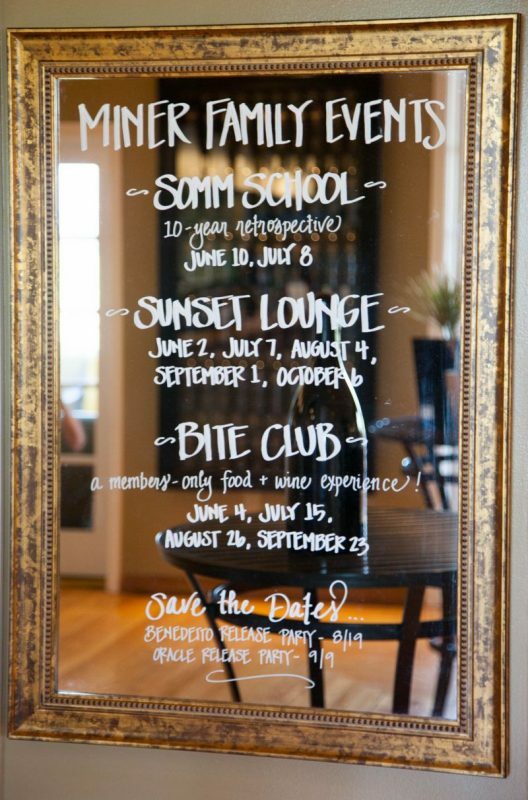 Miner Family offer a range of tasting experiences. They take appointments, but reservations are not required. They are open from 10am to 5pm, but to ensure you have time to enjoy the wines they recommend you arrive no later than 4:15pm. The basic tasting offers six wines for $25. They have a fixed list at weekends, as they tend to get busy. During the week guests can pick six wines from a larger list. You can book a tour of the facility for $40 or $50 if you want a private group. For an additional $15 you can add a cheese plate to your tasting experience, but this must be booked in advance. There is an Oracle blending experience for $65. This takes place in the caves and allows you to try mixing your own version of The Oracle. If you really wish to splurge there is a sommelier tasting which provides tasting of the library wines and comes with a cheese and meat plate. 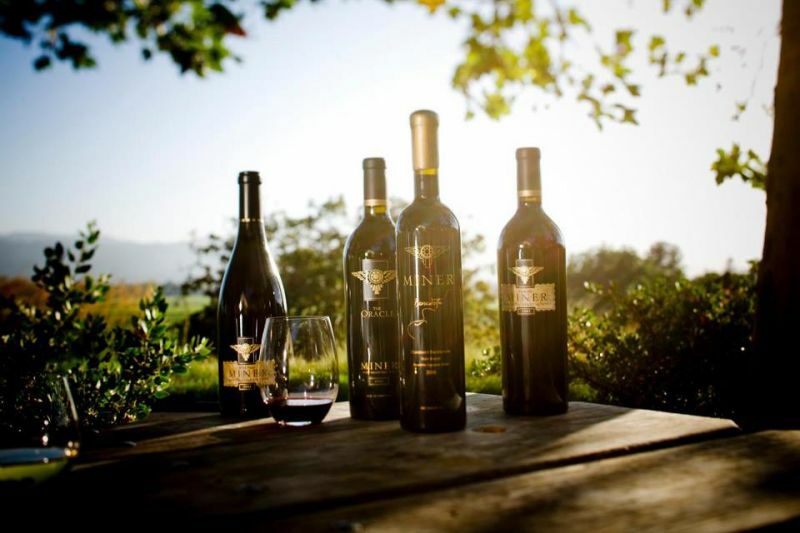 California Girl comments: I would love to do the Somm Experience and the Blending Experience. How fun would that be? 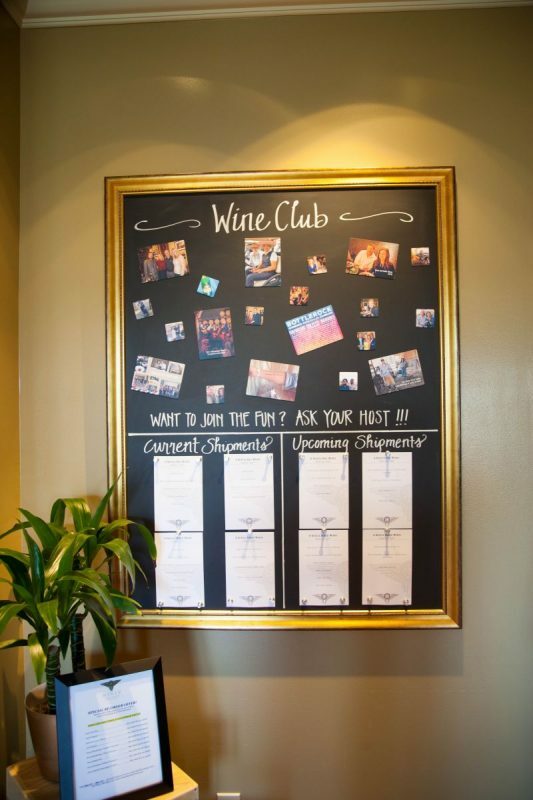 They also have an active wine club and various levels of membership. You can get details of those here. We enjoyed this return visit to Miner Family. All of the people we meet were friendly and enthusiastic. The terrace was an ideal place to sample the wines, all of which were interesting and fairly priced. 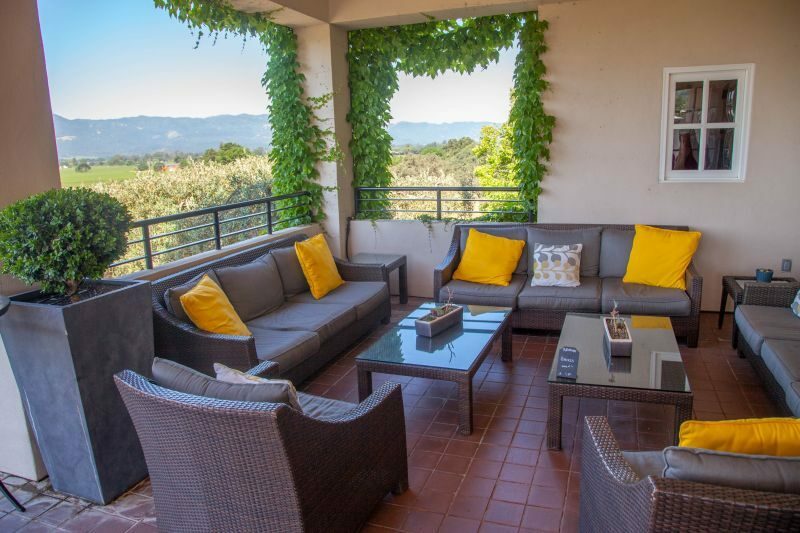 California Girl comments: Insiders tip: Because of the beautiful views overlooking Napa Valley at sunset, Miner Family Winery gets extremely busy. Don’t try to come at the last minute, or overstay your tasting. Instead, venture out during the week so you can relax, without the crowds and the turnover pressure. This is a great place to experience beautiful views, great hospitality and very tasty wines.